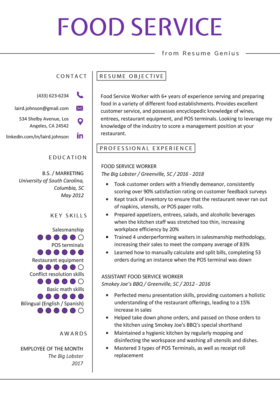 Cook up the perfect chef resume with the free downloadable example, cover letter, and 4 chef-tailored writing tips found below. 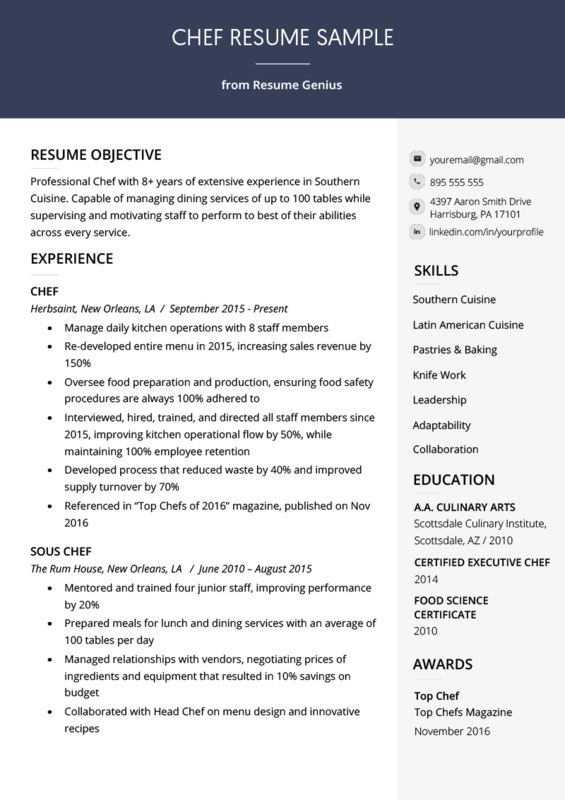 Professional Chef with 9 years of extensive experience in Southern Cuisine. Capable of managing dining services of up to 100 tables while managing and motivating staff to perform to best of abilities across every service. Consistently create new recipes and menus, implementing seasonal ingredients and modern techniques. The fastest way to boost your resume is to display your certifications, and consider what key skills you should emphasize on your resume. You should consider earning certifications if you don’t have any. Learn.org has an excellent page that can help you decide which certifications you can earn, why, and how. Emphasizing these three main key skills on your chef resume will give you an edge. Chefs may seem to lead glamorous lives with the numerous cooking shows we find on TV. However to be a good chef, it not only requires a talented palate, but also leadership, organization, and hard work. Productive Chefs are able to find quality ingredients while managing their budget. They can create new menus that will keep diners coming, as well as lead team members so that the kitchen can be a well-oiled machine. They are reliable, flawlessly serving hungry customers on a daily basis, while ensuring that everyone in the kitchen is working in sync while following proper sanitary and food safety guidelines. As you can see, she’s made a concise and persuasive argument for why she’d be a good candidate for the job. Now, the hiring manager seeing her resume will be intrigued, and look for evidence of her claims further in the resume. The above bullet point proves that the candidate is able to create new dishes rather than just follow instructions by cooking the same thing over and over again. Not only that, the candidate is able to create new products that can attract more customers, and ultimately increase profits. Here, the candidate showed that she has a mindset on ensuring that the restaurant can make money by not only providing great food, but also cutting costs whenever possible. Notice how the sales increase is quantified — you should aim to provide numerical values describing your work experience as well. As shown above, the chef’s ability to decrease waste, not only helps with the restaurant’s profits, but supports the environment. Each bullet point should start with an action verb — but which should you choose? We’ve created a list of common action verbs chef resumes tend to have — but you’re welcome to peruse ‘the longest action verb list in the universe’ if you’d like more choices. The key to writing a good resume is emphasizing your key strengths in a quantified manner. Be sure to give due diligence to researching your successes. 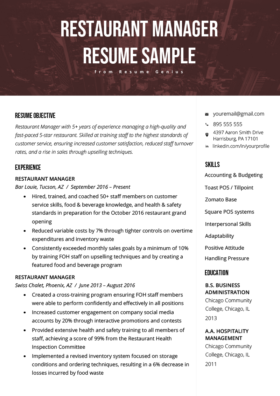 As always, we recommend our resume builder, which provides automatically written bullet points and beautiful pre-made templates for you to use.